Artist Giordano Berti (Tarot of the Elves) with direction from Davide Corsi has created a vibrant computer generated deck based on traditional Rider-Waite-Smith imagery. The Pictorial Key Tarot features detailed textures of gleaming metal, pockmarked stone, smooth marble, rough-hewn wood, and luxurious fabrics that interplay with diverse landscapes containing star-studded skies, leafy vegetation, rippling waters and billowy clouds. While the deck is something of a RWS clone it does take some innovative risks. 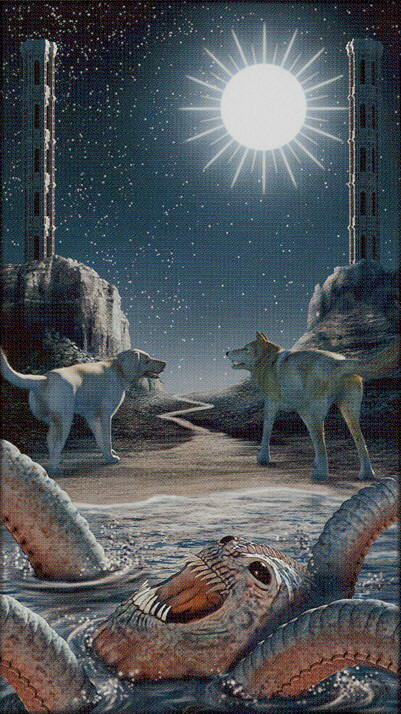 For example, there is a menacing sea monster in the foreground of the Moon card rather than the traditional harmless crustacean.